October 24, 2013 (Los Angeles, CA) - Kings Of Leon announced today the first leg of their American tour in support of their recently released new album, Mechanical Bull. The band will kick off the 2014 MECHANICAL BULL TOUR on February 5, 2014 at Philips Arena in Atlanta, GA. Produced by Live Nation and presented by Klipsch Audio, the tour will feature opener Gary Clark, Jr. on this first leg. Tickets for the general public go on sale starting Friday, November 1 at www.livenation.com. American Express® Cardmembers will have an opportunity to purchase tickets before the general public. The 2014 MECHANICAL BULL TOUR is in support of Kings of Leon’s 6th album, Mechanical Bull, which was released on September 24 on RCA Records and debuted at #2 on the Billboard Top 200 Chart. The album also bowed at #1 on the Rock and Alternative Album charts and #2 on the Digital chart. It debuted at #1 in the UK, which makes it the fourth consecutive Kings of Leon record to do so. Klipsch Audio, a leading global speaker and headphone manufacturer, announced recently that it is the title sponsor of the 2014 MECHANICAL BULL TOUR and that the company has formed a strategic partnership with the band in support of both the album and tour. 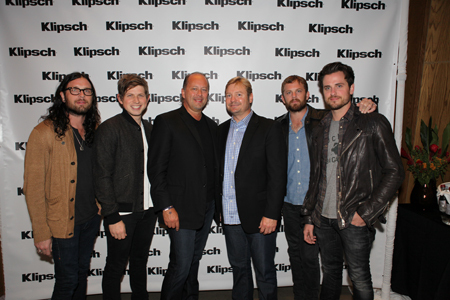 With Kings of Leon, Klipsch found synergies in their Southern roots and a willingness to invest in bringing the emotion of the live music experience to listeners around the world through their premium products. All shows on sale November 1 unless otherwise noted. *Additional dates to be announced. For additional tour and ticket information visit www.kingsofleon.com and www.livenation.com.